I want to begin this conclusion by highlighting the word “theory” in the title. I don’t believe that I have proven anything beyond a doubt in this series, but I have highlighted a pattern of behavior that all points in one direction. I could be wrong, but I just spent 22,000 words going over this so I clearly don’t think I am. I fully acknowledge that I am working with an incomplete set of information, and some of the more unexplainable items in this saga could be dismissed with additional insight. That said, there is one thing that is clear: Trump has been in business with Russian oligarchs for at minimum, nearly two decades, and has demonstrated a desire to expand into Moscow as far back as the 1980s. The fact that the Treasury fined him $10 million for “significant, long standing anti-money laundering violations” at Trump Taj Mahal only heightens the suspicion surrounding his dealings. Ask any Russian (and I did in order to help me understand many of the Russian sources used in this column), and they will tell you that it is a well-known fact that the Taj Mahal was a prime vacation spot for wealthy Russians. Given Trump’s five bankruptcies running companies whose business model literally is rigging the game against their customers, it’s highly unlikely that he could domestically obtain the large credit lines that his voracious business appetite required. It’s undeniable that he was able to acquire some form of credit given that his businesses endured past his bankruptcies and still exist to this very day. If he couldn’t get a million dollar-plus line of credit from Wall Street, where did he get it from? Well, people he has done business with in the past would be a good target—especially whomever he was laundering money for in the Taj Mahal, since they clearly would be able to find avenues to deliver it to him tax-free (or at least tax-lite). The fact that he has refused to settle cases, but settled one around Trump SoHo with the explicit provision that the people bringing the lawsuit against him must stop cooperating with the federal government in a parallel criminal inquiry raises an endless line of red flags. Those red flags are further elevated when you dig into the fact that the financiers of that project leave Trump two degrees of separation away from an Icelandic fund which is very clearly propped up by Kremlin cash. Even more so when you can connect that fund to other projects of his like the failed Trump Tower in Toronto. President Trump has been all over the map with whatever policies he supports at any given moment. He has proposed covering all Americans with health care, but says he is “100%” behind this GOP bill that does not hide the fact that it will throw tens of millions of Americans off health insurance. He said he wanted to get rid of the entire national debt in eight years, yet his first budget proposal adds to it. I could go on and on and on with a multitude of positions of which he has taken every side on, save for one: Vladimir Putin. When Bill O’Reilly set him up for a layup to confirm the very obvious thuggery of Putin’s regime, Trump’s response was “we have bad guys too.” For some reason, Trump will not speak ill of an adversarial government that our entire intelligence community says clearly intervened in the 2016 election to hurt Hillary Clinton (and therefore, help Trump), and that is why the rest of his connections raise suspicion. If he won’t say a bad guy is bad, why? I believe the answer to this question is that Trump has been laundering money for wealthy Russians for years (and by proxy, the Kremlin, since no one gets rich in Vladimir Putin’s Russia without his consent), and not only are many of his businesses largely propped up by Kremlin-connected cash, but they have so much evidence of his illegal activity aiding and abetting a regime opposed to the United States that it effectively holds a gun to his head 24/7. He knows that if he tightens the screws on Putin, that they can be ratcheted up on him tenfold, and that is why he refuses to speak negatively about the Kremlin. Trump is a self-interested actor to the very end, and so all his actions must be viewed through that lens. Russia’s interest in meddling is much more certain. America has been utterly shameless in its attempt to influence supposed democratic processes across the globe, and this brazen Time cover bragging about installing Boris Yeltsin in the Russian government is all the motivation Russia should need. Many are concerned that all this saber rattling will set off another budding military conflict like what we went through in the Cold War, but that is old-world thinking. Russia is not a super power, as their economy is entirely dependent on oil. The value of their currency moves in tandem with the price of this commodity underwriting it. Their military was still in shambles a little over a decade ago, and even though they have made some dramatic investments to modernize it, they still lag far behind the behemoths that are the United States, China, and our NATO allies in Europe. In short, they can’t play on the same level as other global hegemons. What they can do is weaponize their most potent skill: disinformation. The Kremlin has always mastered the art of manipulating information, and the digital age has provided them with a power that rivals the moment Ernest Rutherford split the atom in 1919. 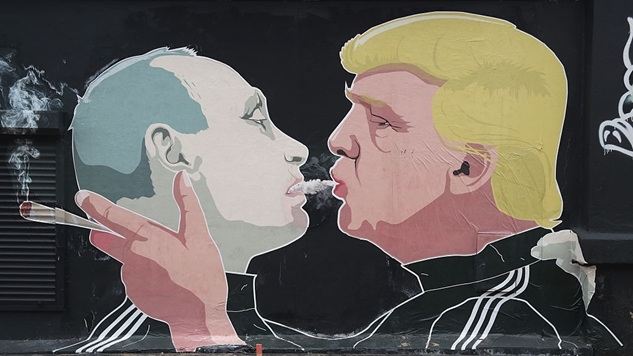 Russia is not allied to Donald Trump, but against traditional American policy, and Trump simply provided them with an ideal vehicle to accomplish those goals. I don’t believe that their influence was so quid pro quo that Trump was literally taking orders from the Kremlin, but that their manipulation was more amorphous, and it came in the form of surrounding Trump with people in their orbit like Paul Manafort, Michael Flynn, and Carter Page. Trump is the opposite of a policy wonk, so all the Russian government needed to do was find a way to package their interests in a way that aligned with his, and the dramatic failure of American foreign policy over the last few decades provided them with the perfect cover. After the debacle of the Iraq War, most Americans now believe that any deviation from the status quo is preferable to the policy pursued from the end of World War II to today—so saying things like “NATO is obsolete” didn’t ring alarm bells the way it would had it been uttered during the 1990s. Once Trump got the ball rolling, combined with his generally disorganized thoughts, it was easy to cloud the obvious storyline at the heart of all this. The fact that Putin has tried to corroborate Trump’s recent statements like his crime-ridden Sweden accusation makes collusion all the more plausible, and at the very least, establishes a level of cooperation. The classic phrase “the cover-up is worse than the crime” is wrong. It really should be “the cover-up is what alerts us to the crime.” As I write this, Devin Nunes—who took the extraordinary step earlier this week of briefing the White House on information he did not share with his committee members—unilaterally backtracked on a promise the House Intelligence Committee made to the American public, and cancelled the rest of the open hearings planned on this topic. To use a phrase from the 2008 election, he has completely gone rogue from his entire committee. This follows the pattern of other Trump associates like Flynn, Manafort, Page and Jeff Sessions of backtracking on previous commitments and statements—all of which obscure the truth of whatever happened as it relates to the Kremlin. Whatever you think of this saga, you must admit that this is not how innocent people act. Everything emanating from Team Trump points towards a cover-up of something related to this Russian investigation that we now can confirm has a focus on some of his associates. Let's remove all analytical reasoning from this for a moment and fall back on our basic human instincts. If you knew nothing about this entire ordeal, would you believe this guy? Now the White House is saying that their former campaign manager had a “very limited role,” that the man they appointed National Security Adviser was a “volunteer,” and a member of their transition team who chairs the House Intelligence Committee overseeing this investigation claims he has never heard of Carter Page—who was one of five foreign policy advisors initially named to Trump’s campaign—and Roger Stone, a longtime D.C. operative who has been advising Donald Trump since the 1980s. 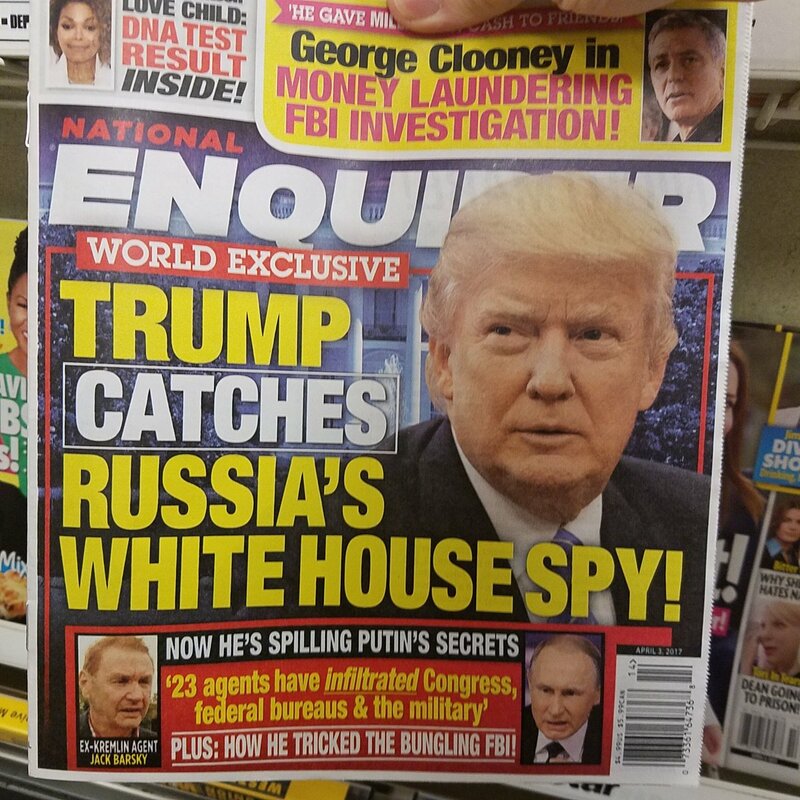 The National Enquirer, which is essentially a Trump-branded tabloid, is now asserting that Michael Flynn is a Russian spy and that Trump was the one who caught him. These are all very recent talking points which deviate from their previous one that this entire investigation is bunk, and that the aforementioned four advisers in question are all above board. The walls are closing in on the White House, as the drip drip drip of information leaking from the intelligence community continues this slow march towards the obvious conclusion: Donald Trump is beholden to Russian interests, and he willingly accepted their help in his campaign to become president of the United States. This is the most important story of our time, and the response to the remarkable efforts by the White House to stonewall the investigation will either prove America’s resilience or accelerate our descent into the dustbin of history’s great empires.